Crystal Blue Water Structuring Units harness EMF emanating from the pressurized chamber, thus optimizing quality of EMF being carried into the plants, animals, soils and people, resulting in increased productivity and health. Our observations show that our Crystal Blue devices produce the perfect amount of electro-magnetic force (not too much and not too little...BALANCE), to sustain and enhance cellular growth, repair, and health. 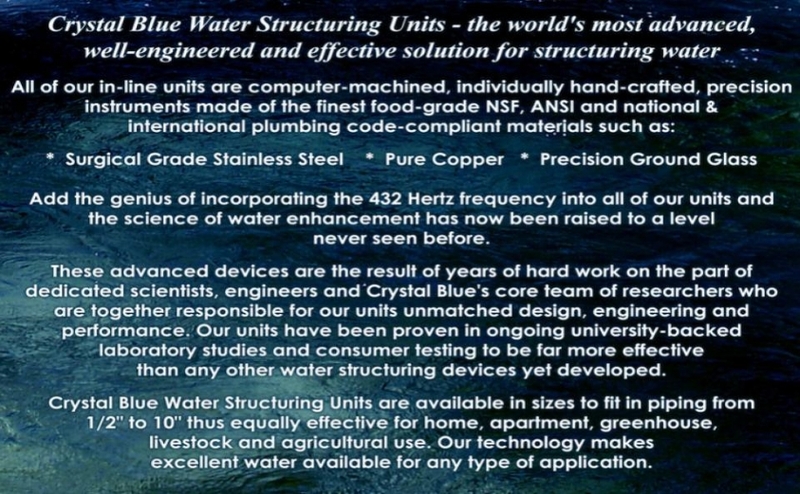 This piezoelectric induced force is what “fixes” the electronically imbalanced (toxic) elements (chlorine, fluoride, etc)- That being said, and again while we do not claim that our Crystal Blue Water Structuring Units eliminate the chemical residues such as pesticides from the water, nor are we allowed by law to make any specific health claims about structured water (as other companies are now doing), we do know from plant, animal and GDV testing that the harmful effects of drinking toxic water appear to be rendered biologically harmless to the living cell. The GDV, plant and animal tests pictured throughout our web site were all primarily done using water heavily-laden with toxic agricultural and sanitizing chemicals. Crystal Blue Water Structuring Device at the World Water Conference! *An independent mineral assays done at prestigious analytical laboratory in the North America, as well as our own research, confirms that our "Power Rock™" is one of the most elusive and important mineral substances on the planet, containing nearly all of the naturally-occurring mineral elements while showing extraordinarily high amounts of precious and semi precious minerals, crystals, paramagnetics and semiconductors. The PowerRock mineral mix (rare earth and infrared generating minerals, 12 different types of sun dried sea vegetation, seven different healing herbs, ATP (the cell's energy molecule), 14 different medicinal mushrooms (4:1 concentrated extracts), healing clay, fulvic and humic acid, Shungite, and Monatomic Iridium) that completely surrounds the inner core of the unit is compressed under an 26,000+ pounds of pressure on every square inch of the crystalline material. We have been told by top geologists that we have the only available source of the precious rock in the entire world. Click Here to Buy Your Crystal Blue Unit!